There's a problem with the policies now imposed on transportation fuels in an attempt to control CO2 emissions. The issue has to do with how carbon is counted when the policies are defined. Good accounting needs to reflect the fact that motor fuels are liquids that contain carbon as their molecular backbone. By nature, liquids flow. That's one main reason why they are so valuable for fueling cars, trucks, ships and planes. Carbon flows with the fuels, and it's the rate at which the carbon flows to and from the atmosphere in the form of CO2 that matters for global warming. Note the "to and from" in the previous sentence. A big focus of climate policy is reducing CO2 emissions, e.g., reducing the rate at which carbon flows into the air due to energy use. But the from part is also important, and in fact, the CO2 problem is best described as an imbalance in the global carbon cycle due to human activities that cause carbon to flow into the atmosphere faster than natural processes can remove it. 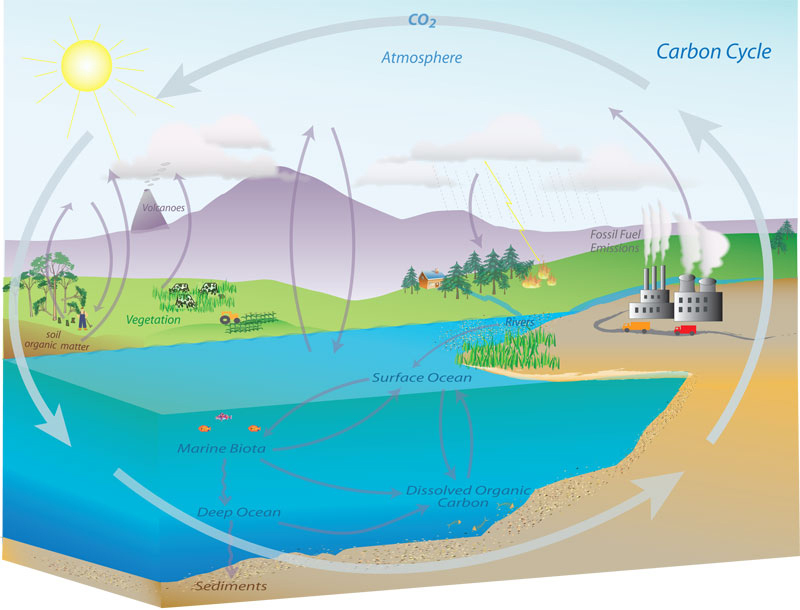 The carbon cycle matters a lot when biofuels enter the picture. To protect the climate, biofuels must increase the from part of the carbon cycle; that is to say, they have to increase the net rate at which CO2 is removed from the atmosphere. After all, they don't decrease the to part of the cycle because simple chemistry tells us that a given biofuel emits essentially the same amount of CO2 as the fossil fuel it replaces. As I've put it elsewhere, if biofuels have a benefit, it's not when they're burned. Two researchers just published an analysis showing something that many casual observers have long realized about the political challenges of using taxes to address externalities. Liddle & Lung (2015) find that countries whose citizenries consume a lot of fuel tend to tax fuel at lower rates than countries with relatively lower consumer demand for fuel. In other words, the nations having a greater need to "get the prices right" through some form of consumption tax are, politically speaking, less likely to pursue the types of taxation that economists would recommend. Recent MIT simulations suggest that when CO2 is injected underground into saline aquifers, much less of it may solidify than most carbon capture and storage (CCS) studies have assumed. The implications are that such CCS may be less stable than hoped and also that the capacity for CO2 sequestration would be much lower than past research has calculated (see "Sequestration on shaky ground" from MIT News). This form of CCS is not very relevant for mitigating emissions from liquid fuel use. However, the hypothetical "BECCS" (bioenergy with CCS) systems that some analysts have highlighted as a potential source of so-called low-carbon liquid fuels would also face such limitations.